In the small town of Lorsch, between Worms and Darmstadt, is the renowned Torhalle, one of the rare Carolingian buildings that have retained its original appearance. It is a reminder of the past grandeur of an abbey founded around 760-64. The first Abbot was the Bishop of Metz, Chrodegang (died 766). Sometime before 764 he brought monks from Gorze to live there and in 765 he donated the relics of St Nazarius, which he had acquired in Rome. In 767, Thurincbert, one of the founder’s brothers, donated new land in sand dunes safe from floods about 500 m from the original site. The monastery was placed under the Emperor’s protection in 772. In 774, with Charlemagne in attendance, the Archbishop of Mainz consecrated the new church, dedicated to Saints Peter, Paul and Nazarius. The Codex Laureshamensis, a chronicle of the abbey, lists the improvements made by three of the most important abbots, Helmerich, Richbod, and Adelog, between 778 and 837. 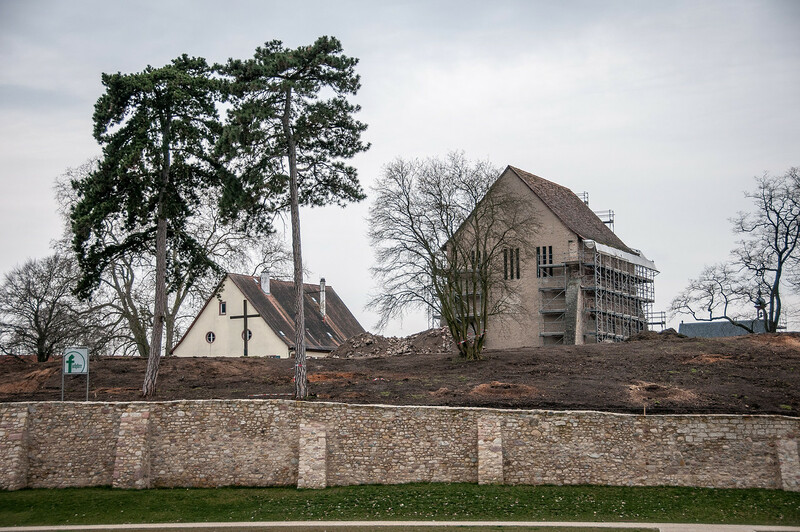 The monastery’s zenith was probably in 876 when on the death of Louis II the German (876) it became the burial place for the Carolingian kings of Germany. To be a worthy resting place for the remains of his father, Louis III the Young (876-82) had a crypt built, an ecclesia varia, where he was also buried, as were his son Hugo and Cunegonde, wife of Conrad I (the Duke of Franconia elected King of Germany at the death of the last of the German Carolingians, Louis IV the Child). Sometimes you get lucky when visiting world heritage sites and sometimes you don’t. Lorsch was not one of my better visits. 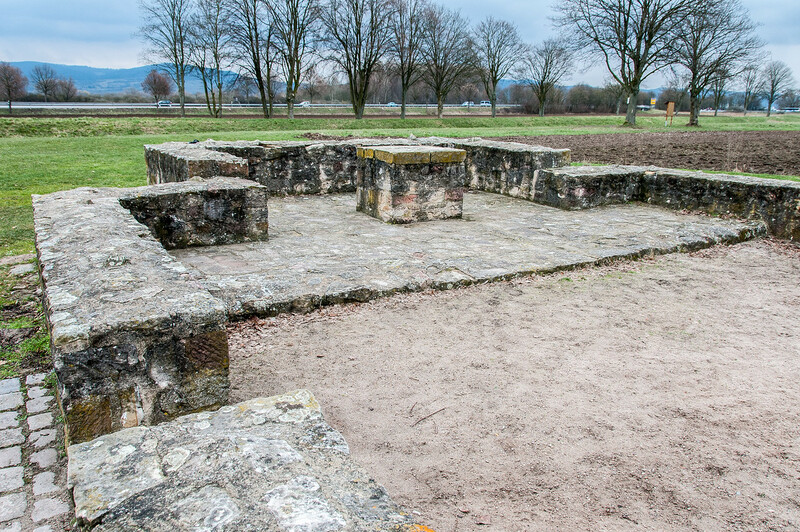 For starters, Lorsch is one of the smallest world heritage sites I’ve ever visited. The site consists of 2 small structures and the foundation stones of a third. That’s it. Those two structures were both under serious renovation when I arrived (see photo). I couldn’t enter either building and they were both covered with scaffolding so I couldn’t even take a clean photo. They are also redoing all the landscaping around the buildings. Finally, I showed up on a Monday, the one day of the week when their museum was closed. The Abbey of Lorsch is very historic and probably worth a short visit if you are traveling south of Frankfurt. However, it won’t be worth visiting until 2014 when they have completed their work. I’m going to create a new list of world heritage sites I intend to revisit and Lorsch is going to be at the top of my list. The Abbey and Altenmünster of Lorsch are a cultural UNESCO World Heritage Site in Lorsch, Germany. It is recognized by UNESCO as one of few and rare surviving monuments from the Charlemagne era. The abbey, which is the primary feature of this UNESCO site, was founded in the year 764. It served as the proprietary church and monastery of the state during that time. Meanwhile, it was also a pilgrimage place since the body of Saint Nazarius was located in the abbey and monastery. 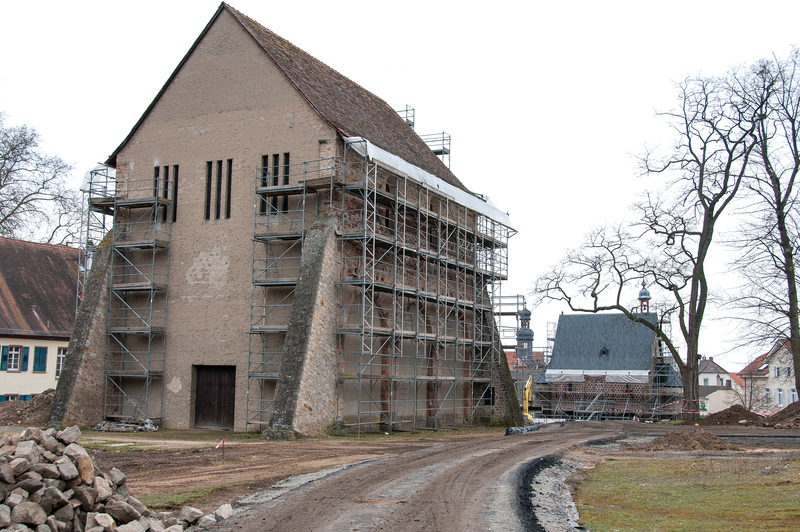 Even though the Abbey and Altenmünster of Lorsch are in a ruined state, it remains as one of the most important monuments depicting pre-Romanesque-Carolingian style buildings in the country. It is also a valuable document that relates to medieval German history. The Abbey and Altenmünster of Lorsch were inscribed in 1991 into the list of UNESCO World Heritage Sites in Germany. Prior to being added to the list, it was deferred a couple of times (once in 1989 and another in 1990). When you visit this site, the monumental entrance known as “Torhall” is what will greet you. It will also provide a glimpse of the architectural landscape during the Carolingian era. It is a reminder of the grandeur of the past by the time when the abbey was initially founded. The height of the monastery was during the year 876 since it became the burial place for the Carolinian kings. In fact, Louis II the German was also buried at this abbey. The power and grandeur of the Charlemagne era continued until the 11th century. However, the abbey was hit by a fire in 1090. This prompted an expansive reconstruction to be done on the site in the 12th century. Once the city of Lorsch was incorporated into the Electorate of Mainz, it lost a large portion of its privileges. The church was also restored from the fire but it was changed to adapt to the liturgical needs of the parish. Eventually, the grandeur of the Carolingian area deteriorated as politics and war continued to threaten its status. Despite the fact that the abbey and monastery lost its grandeur, Abbey and Altenmünster of Lorsch is recognized today as a valuable cultural site. It relates mostly to the architectural remains and how it depicts the architectural style of the era. Specifically, it represents the rise, glory and the fall of one of the greatest abbeys in Europe. Aside from the abbey itself, there is also a large portion of the land where the abbey sits on that had been preserved. It is considered an archaeological site that contains relics with over 800 years of history linking to the monastic life in the region. The fragments from the ancient library together with the monumental remains of the abbey form one of the most powerful and active spiritual centers in Central Europe.